Pecatonica Beer Company has its headquarters in Gratiot, Wisconsin, by Highways 11 and 78 in Lafayette County. Its Tap Room offers up these beers several miles south via 78 in Warren just over the Illinois border, making it something of a bi-state brewery. 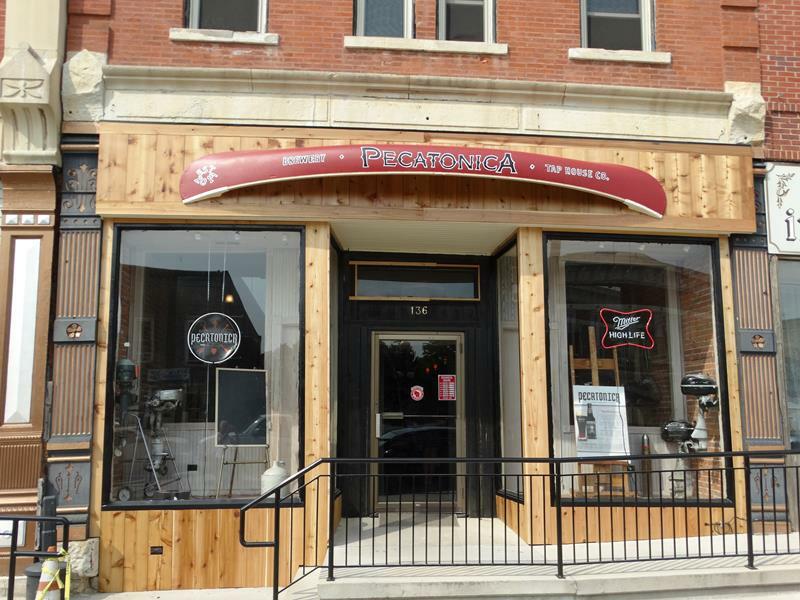 The Pecatonica Tap Room is on Warren’s Main Street, which is part of an historic stagecoach trail. 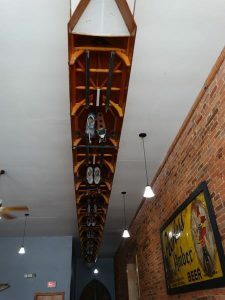 The front of Pecatonica’s Tap Room, complete with a canoe hovering above along Highway 78 in Warren, just south of the Wisconsin-Illinois border. 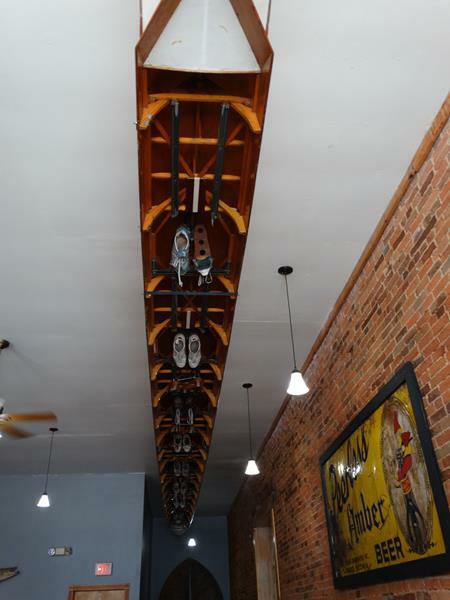 Pecatonica features a UW rowing crew boat – but it won’t get in your way – it’s suspended from the ceiling. As of this writing, they offer four annual beers: the Muskelager Lager, Alphorn Ale, Quinn’s Amber Lager, and their Pecatonica IPA. Seasonals at this time include Oktoberfest, the Belgian Beauty, the Irish Red, and the Nightfall Lager. A relationship with Potosi Brewing Company means they also offer some Potosi beers, as well as other guest brews based on the time of year and demand. 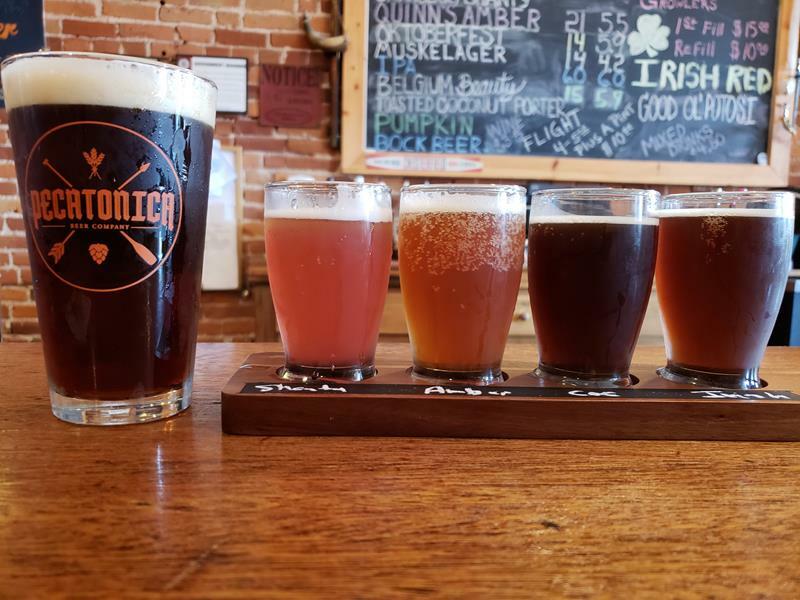 Quite quaffable samplers at Pecatonica Beer Company’s Tap Room.